Lawrence Sperry was an extraordinarily prolific American aviation inventor. By the time his life was rudely cut short at a young age, he had secured over 20 patents relating to aviation safety. Among the many devices he developed were the automatic pilot, the turn-and-bank indicator and a compact personal parachute that could be fitted in a seat pack. He also designed retractable landing gear for aircraft. He was among the first to fly regularly at night and to make parachute jumps just for fun. He even designed rudimentary unmanned aircraft and aerial torpedoes that were later refined into operational devices. 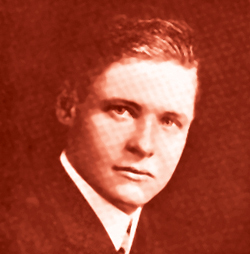 Lawrence Burst Sperry was born on December 22, 1892, in Chicago, Illinois. He had a natural aptitude for all things mechanical, something he probably inherited from his famous inventor father, Elmer Sperry. As a boy, he and his big brother built and flew a glider in the family backyard and later a powered aircraft. Lawrence seemed to have a natural ability to fly because he took his homemade plane to a height of about 500 feet and even landed it safely, without instruction of any kind. However, he knew that if he wished to make a career in flying he would have to receive formal training. He joined the aviation school run by Glenn Curtiss at Hammondsport, New York, and on October 15, 1913, he was awarded pilot’s licence #11 from the Aero Club of America. At the time he was the youngest pilot in the United States. Glenn Curtiss was then engaged in developing a hydroplane for the US Navy and Sperry hit upon the idea of designing a gyroscopic stabiliser for flying machines. This again was quite natural since his father had invented a gyrocompass for use on battleships. Lawrence felt that if gyroscopes could control an aircraft’s yaw, pitch and roll, they could be made part of an automatic control system that would keep an aircraft on a steady course and attitude in all eventualities. In case of any inadvertent deviation, flight corrections would be automatically introduced depending on the original gyroscope settings. The device he finally put together needed four gyroscopes spinning at 7,000 rpm and weighed just 40 pounds. After some fine-tuning it was time to demonstrate it in public. And the occasion Sperry chose was the Concours de la Securité en Aéroplane (Aeroplane Safety Competition) in Paris. It was June 18, 1914. Thousands of spectators lined the River Seine to watch the events. Sperry’s was the last of 57 pioneering planes taking part. He and his French assistant, Emil Cachin, were flying a single-engine Curtiss C-2 biplane with a hydroplane fuselage. On the first pass down the river, in front of the judge’s stand, Sperry simply held both his arms high. Although the C-2 was obviously not being controlled, it continued on a straight and level course, quite unlike some other skittish machines on display that often needed all the pilots’ skill and involvement to fly steadily. On the next pass, he made Cachin exit the cockpit and move towards the wingtip. The crowd could see that Sperry’s hands were still high up in the air. The aircraft’s wing began to dip, but the gyroscope-equipped stabiliser immediately corrected this banking tendency and kept the aircraft steady. Then came the grand finale. This time as the aircraft approached the judges, the crowd could clearly see one crew member out on each wing, waving to them, and the cockpit empty. Recall that it was 1914, and powered flight was just 11 years old; so this was surely one of the most spectacular demonstrations in the history of aviation till then. Sperry won the 50,000 franc first prize and became famous overnight. When World War I started a few weeks later Sperry tried to join a French military squadron but his lack of a college degree came in the way. He returned to the United States to continue his aviation research. In 1916, he was commissioned as a lieutenant in the US Navy and became a flight instructor. His father’s company, the Sperry Gyroscope Company, designed a pilotless aircraft guided by Lawrence Sperry’s autopilot. However, the idea was only put into practice during World War II. Lawrence produced an amphibious flying boat, the first in history. He also designed various flight instruments like an airspeed indicator, a drift indicator and an improved magnetic compass that facilitated aircraft piloting even when the visibility was zero. Having designed so many useful instruments, he was best qualified to refine the techniques of night flying and went on to make night flights of up to 130 kilometres. He was always personally involved in the flight testing and demonstration of his remarkable inventions. He even used a period when he was grounded for three months, due to a broken pelvis suffered in a crash, to design a new and improved parachute. The Sperry seat or backpack parachute eliminated the problem of the parachute becoming entangled in the aircraft tail assembly. By the time he turned 31, Sperry had accumulated more than 4,000 flying hours. He preferred to fly aircraft of which he had personally designed the instrumentation and his training and experience gave him the confidence to fly in practically any weather. On December 23, 1923, he took off from England bound for France in a Messenger, an aircraft he had personally designed. The English Channel was heavily fogbound and perhaps the conditions were beyond even his extraordinary capability. The plane’s wreckage was found in the water and his body was recovered 20 days later. The basic gyroscopic flight instruments like the turn-and-bank indicator and artificial horizon that Lawrence Sperry designed and developed equip every aircraft in the world even today, whether commercial, military or private. Not for nothing was he nicknamed “Gyro”.